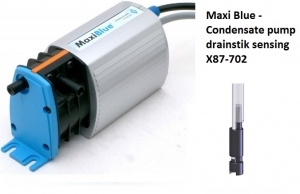 Maxi Blue condensate pump drainstik sensing model X87-702 is part of the Blue Diamond range of condensate pumps all backed by a 3 year warranty from the manufacturer Charles Austen. These rotary type condensate pumps offer unrivalled reliability and can even run dry without any damage to the pump. This model the Maxi Blue X87-702 condensate pump is fitted with the drainstik sensing option.